The Southern California Counseling Center is hosting a screening and panel discussion with Director Ben Lear of the award winning documentary film, THEY CALL US MONSTERS. Thursday, February 15th at 7:30pm. 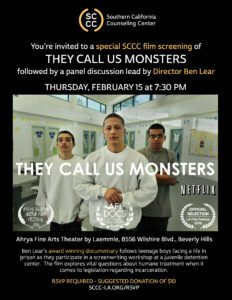 THEY CALL US MONSTERS takes viewers behind the walls of the Compound, the facility where Los Angeles houses its most violent juvenile criminals. To their advocates, they’re kids. To the system, they’re adults. To their victims, they’re monsters. In California, violent juveniles between 14-17 years old can be tried as adults. Typically, they are accused of heinous crimes–murders and attempted murders–that leave their victims’ families shattered. And yet, they are still kids, with a greater capacity to change and one-day return to society. What is our responsibility to these kids? And to their victims? Do they deserve a second chance? These are the questions legislators are grappling with across the country as they attempt to reform our juvenile justice system. Director/Producer, Ben Lear will be present along with a few other cast members to take part in a panel discussion after the film. No Replies to "They Call Us Monsters - Screening & Panel with Director Ben Lear"